Enjoy the sweet sights and sounds of your family having a great vacation in this lovely home tucked away in the peaceful surroundings of Ocean Sands. 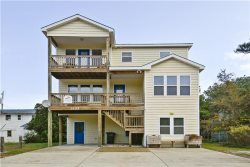 Conveniently located within an easy walk to the beach, and located approximately 0.2 miles away from the Porpoise Point beach access, this home is an ideal spot for coastal lovers to land. Sandpiper Lookout is also close to a prestigious golf course, community tennis, shopping and restaurants, and guests will find hours of brilliant fun at home courtesy of a splash-worthy private pool and hot tub. The ground level is where the good times roll, thanks to a rec room with TV, VCR & Queen Sleeper Sofa, a Wet Bar with Full-size fridge, and a nearby bedroom with a king bed for a little privacy. Upstairs, sweet dreams are waiting in three additional bedrooms, which includes a bedroom with a queen bed, a bedroom with a double bed, and a bedroom with 2 twins. A laundry closet and hall bath are situated nearby, and guests can step out to the breezy decks at any time to enjoy a breath of fresh salt air. The top level is where the whole family can stretch out and relax, thanks to a Living Area with TV, VCR & DVD, a nearby kitchen area, and a large sundeck with extensive neighborhood views that’s just steps away. Furnished with style and charm, and cozy and perfectly comfortable throughout, families will want to flock to Sandpiper Lookout again and again.